There are so many great conversations on the Hotline -- it's hard to choose a favorite. But we'll be doing it, once a week, to spread the wealth of our community's knowledge -- and to keep the conversation going. 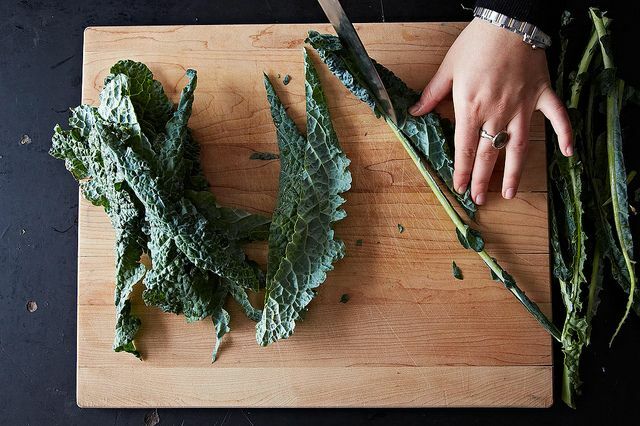 Today: We love kale's leaves, but its tough stems stump us. In honor of Earth Day, we're about to change that. Naomi cooks them fresh: "I cut them into small pieces, sauté them first (they take longer to cook), then add the cut-up leaves, and then some freshly grated nutmeg, minced fresh garlic, salt, and pepper at the end. Can't be better (or any easier)." Break out the canning jars and try your hand at preserving, like claire miller, who pickles them or breaks them down in a food processor to ferment, kimchi-style. Several of you suggested the classic scrap treatment: a good simmer in the stockpot. Says Eliz. : "We're told that members of the brassica family are too assertive for such use...but kale does not overpower." First We Eat agrees, but suggests adding other vegetables to balance the flavor. Try blending them into your juice and smoothies, like lisina does. The fibrous stems are best paired with creamier add-ins -- think banana, avocado, or yogurt. How do you use tough vegetable stems? Tell us in the comments! Fond of large dogs, tiny houses, pungent cheese, and dessert for dinner (or breakfast). I include stems in a very finely chopped kale-cranberries-almonds salad (honey-lemon dressing). Once they're chopped to millimeter size, they're tender. Also use them, less finely chopped, in coleslaw (along w/broccoli stems). I put the kale stems on one side of the baking sheet and the leaves on the other. When I take the kale chips out, I spread the kale stems out more and continue to bake the stems until they turn brown and they are crunchy good. I used to dredge them in olive oil & salt & lemon juice or wasabi powder, but I am on a diet now so I wash them and bake them. Tastes better when dressed, but not bad without. I put them in the freezer. They make it great dog treat. My dog loves frozen kale stems! Pesto, with almonds and parmesan and garlic scapes. KISS is my way of enjoying the stems of kale. Cut into small pieces add to pan with garlic, cumin and ginger BEFORE scrambling eggs. dice them and add them to any long simmered veg soup. My friend from Ethiopia slow cooks them in a saucepan with minced ginger, sliced onions and garlic. They're delicious and tender. Finely sliced, blanched, frozen, then tossed into minestrone to simmer with other vegetables. I've run the chopped stems through my food processor and added a cup or more of the resulting fine mince to a banana quick bread recipe. they are a lovely green when you cut into or break open a muffin but I don't find there is a lot of difference in the taste of the breads and it adds great fiber. My daughter loves these muffins, but won't eat kale served as a vegetable. Bake them the same way you would do with Asparagus. They have the same texture as the bottoms of asparagus but juicer. Make a kale and garbanzo bean soup with them and blend or leave chopped. Put them in green smoothies! I munch on them raw while I'm cooking. The stems are my favorite part! Good Idea, Sharon. I so like making my own broths. I save all my veggie "scraps", throw them in a bag in the freezer. When I have enough I wrap them in cheesecloth, place them in the crockpot, fill with water. A few hours later you have the most AMAZING veggie broth!!! I finely cut them crosswise and add them to soups or rice dishes: stir fries, risottos. Yum. I feed them to our chickens!